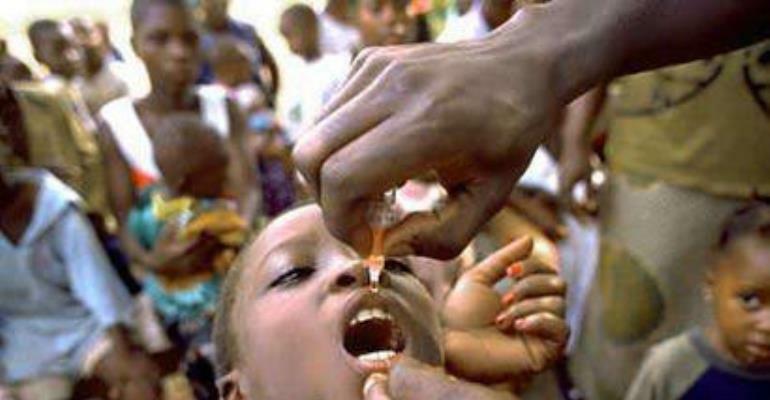 Sekondi, March 24, GNA - The Western Region failed to achieve its target of immunizing 620,000 children aged between zero and five years during the first round of the National Polio Immunisation Exercise. Doctor Godwin Y. Afenyadu, Western Regional Public Health Specialists, who announced this at a media briefing at Sekondi on Tuesday, said the Ghana Health Service (GHS) managed to reach 617,285 children, representing 99.6 per cent. Dr Afenyadu said in spite of constraints, the Service was determined to eradicate polio from the Region and was; therefore, collaborating with the various district assemblies, volunteers and other individuals and organisations to ensure that all the children were covered during the second round that begins from March 26 to March 28. He said the Service had made adequate funds and logistics available through the District Assemblies' Micro Planning Scheme to reach remote areas. Dr Afenyadu said the Service would strive to reach all eligible children in the subsequent rounds in October and November by adopting improved social mobilisation strategies, micro planning and improved supervision. He urged the media to support the GHS in its efforts to eradicate polio and other diseases. Dr Afenyadu urged all Ghanaians to assist the volunteers by restraining their dogs and making their children available for the exercise, adding: "Any parent, who refuses to cooperate, does so at the risk of his children." He said the polio vaccines are safe and could protect children against contracting the virus. Polio is an infectious disease that commonly causes lameness in the arms, legs and upper part of the body of children. It affects the nerves and muscles and causes paralysis with the affected limbs becoming thin and shortened over a period.